Products – Cameras – CM-AB216 – Team Research Inc.
*Viewer software is for Windows PC only, but Recorded video can be played with any media player that supports .MOV format. Professional 2-channel dashcam system featured with full HD 1080P front and HD 720P rear cameras, 3.5″ LCD screen, dedicated viewer player software*, Built-in GPS, Microphone, Speaker, and upgradeable 16 GB micro SD card storage provides you a piece of mind when driving. Infinite Mode: The camera will always record and automatically replace historical data. Event Mode: Camera will start recording based for accidents, sudden brakes, accelerations, and turns, or other impact on vehicle. Manual Mode: Press a button to start recording manually. Parking Mode: The camera will start recording either an impact or a movement is detected. 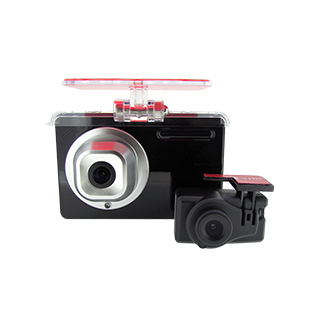 • AB216 provides drivers extra level of protection by offering two separate HD front and back cameras. • 3.5″ touch screen LCD with picture in picture (PIP) feature offers easy control, setup, and playback without connecting to other devices, no WiFi needed. • Advanced recording modes include Infinite, Event, Manual and intelligent Parking triggered by impact and movement detections. • Dedicated viewer player software* brings all relevant data in the same user interface containing front & back videos, time information, GPS location, vehicle speed, and impact forces. • Upgradeable storage supports 8GB, 16GB, 32GB and 64GB micro SD card (16GB included).